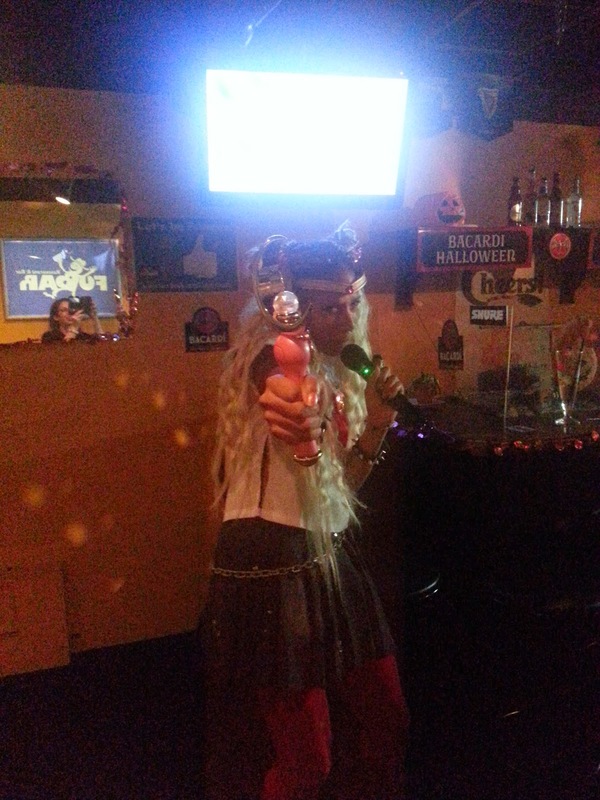 PunkRock Sailor Moon is not to be trifled with. 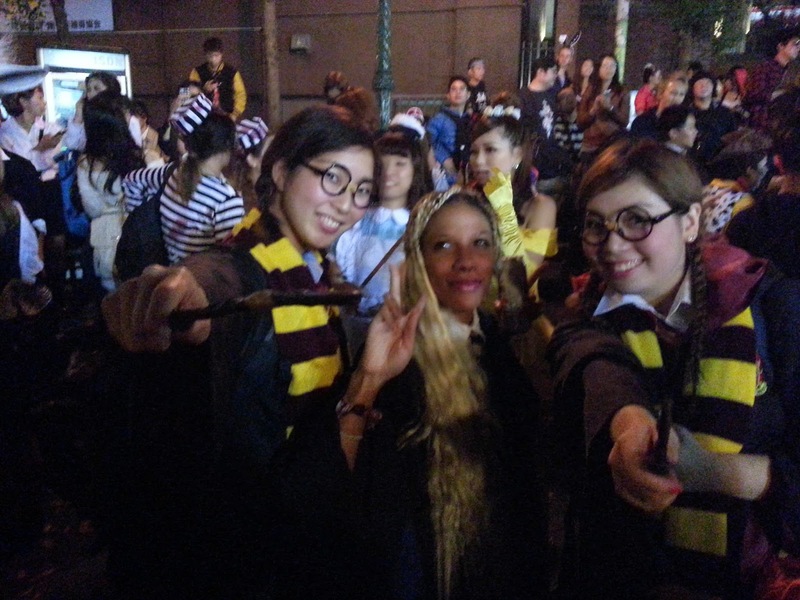 Well, Halloween in Kansai for 2014 was fairly eventful. And I know what you must be thinking, if it was so eventful, why couldn’t you write about it!? Well… I planned on doing that. But life, as it tends to do, got a bit hectic, and I was jumping around so much between fulltime work and part-time work, that it wasn’t worth the trouble to update the blog and lose hours of sleep or drawing time (updating blogs is a lot a trouble, so much respect to those who do it at any kind of consistent pace while working fulltime). But now there is a lull, and I have a plethora of make-up posts! Yay! I’ll try to keep the details as clear as possible, but I have a rather shoddy memory and the alcohol imbibed at many of these events surely didn’t help. Hahaha, que sera sera! 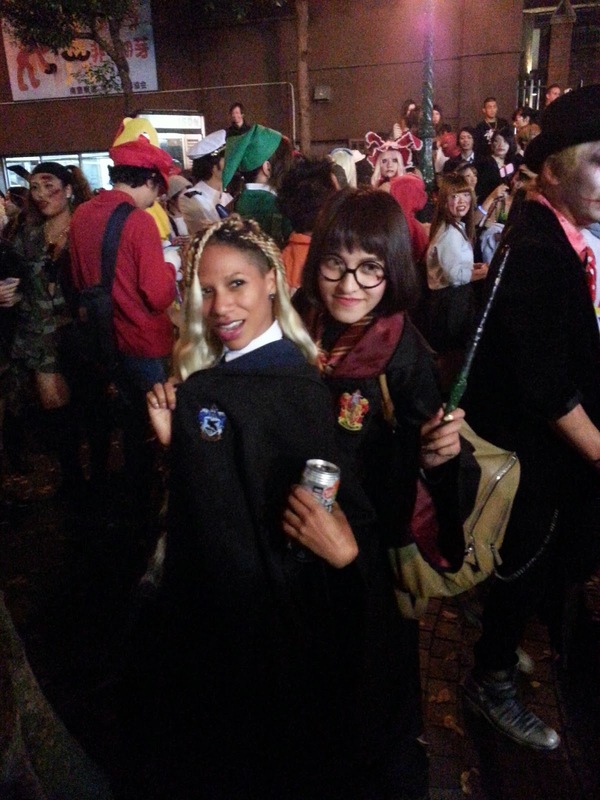 Anyway, this year I had a few Halloween party gatherings with friends, so I was able to visit a pole dancing Halloween party, hung out at Triangle Park for Halloweening and hit up this neat party in Big Step in America-mura. Pole dancing is a still a relatively recent form of dance in Japan, so there aren’t many schools that offer lessons, and there are almost no strip clubs for any study/practice. Instead, many clubs and normal bars may have poles set up on bars or off in distant corners of the room (Bar One by Sam & Dave has that setup). And then, some bars will have special pole dancing shows where they set up collapsible poles just for the event that day, then put them away later. This event was just one such event, but it featured my pole dancing teacher and some students from her class. I believe they’re all dancers at clubs and bars in Osaka but this was my first time seeing them in action! The bar was fairly small, but the crowd eclectic, and that made for a pretty good time. They also had a death metal show (I really don’t know how else to describe it) and some other modern/interpretive dance act. Because of the close quarters, the atmosphere felt a bit friendlier than your usually bar/club event. I definitely recommend these kinds of events for people interesting in getting to know other party-goers. 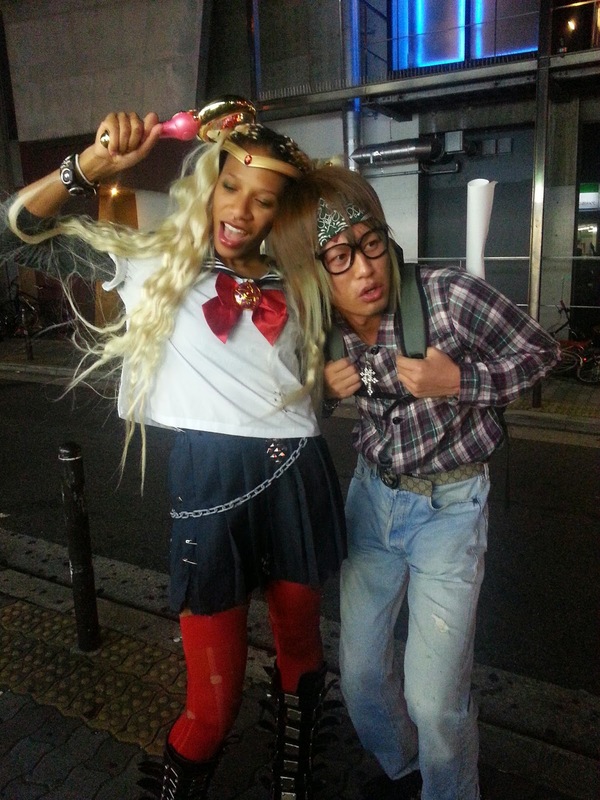 PunkRock Sailor Moon meets the Otaku-Man. Every year in Triangle Park (a tiny park located in the depths of Ame-mura), people gather in costume to drink, take photos and hang out. There are no organizers for this event, so everyone just drinks whatever’s in the convenience store nearby and finds a spot to stand in while snapping photos. I would say this is similar to what goes on in Tokyo’s Roppongi, but I wouldn’t know since I’ve never been. However, based on what I’ve seen on TV, it appears to be pretty similar. 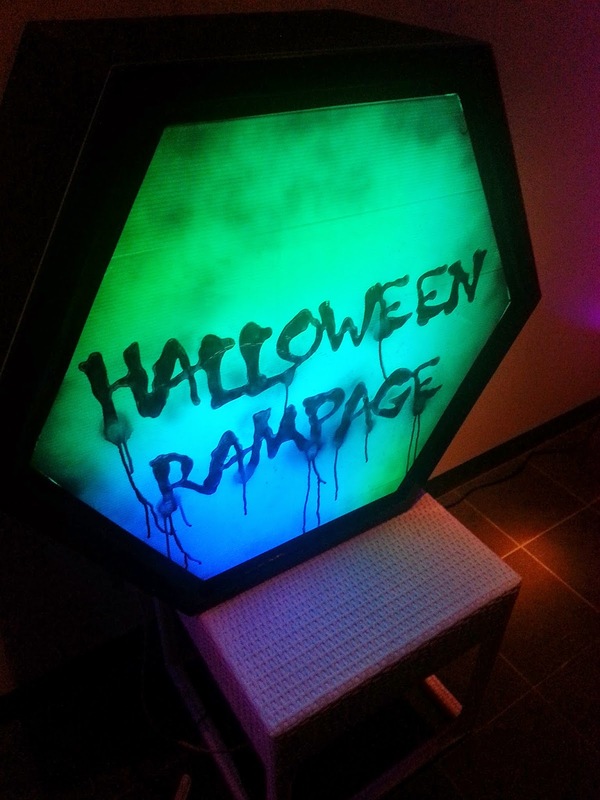 This was probably my favorite Halloween event because it was a.) free and b.) a lot of fun. 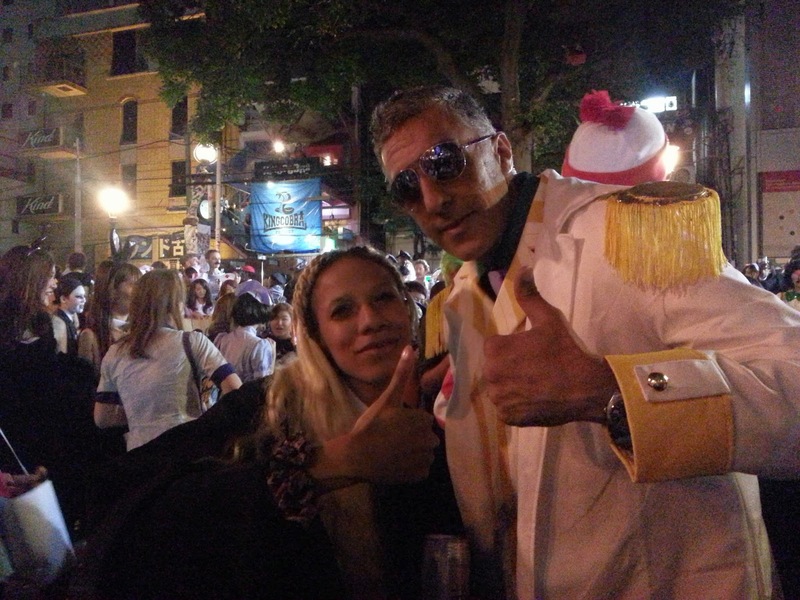 There are police officers out to keep wilder folks in check, but for the most part, everyone is just looking for a good time and a good costume. 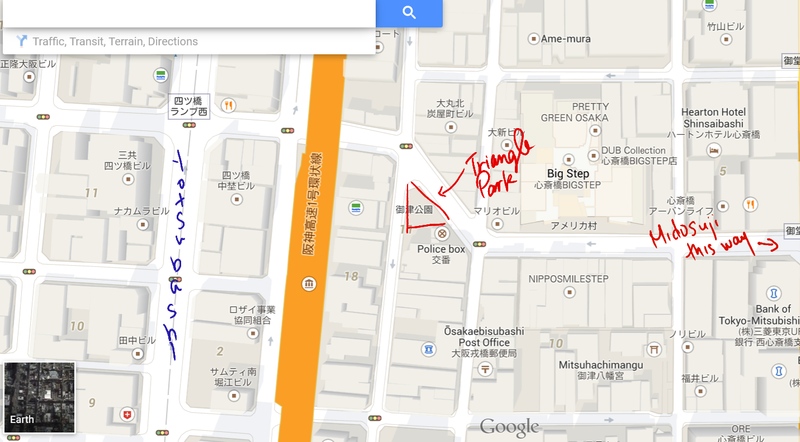 This is actually the address to the police box that sits in front of the park, but it’s closer to the park than where Google puts you if you search Triangle Park/Mitsu Park/Ame-mura. Quite a few Hogwarts students out! Spot-on Kizaru is spot on. Daft Punk even showed up! This was an event that I was invited to by a friend of mine that helps promote events. The event has been going for several years, but this was my first time going. I think it was something like 3,000 yen to get in, and that only included a drink ticket or two. There was some food available inside as well, but it was pretty pricey for the small plateful they handed out (but we all know when you’re drunk and hungry, all logic is lost). There were 3 different, decently sized rooms, each with its own DJ, but only 1 had a bar. This led to long and confusing bar lines. There were also a few private rooms near the entrance of the event, but I never got a peek inside because I didn’t want to catch site of anything unfortunate. There was also only 1 bathroom, which led to more ridiculous lines. We couldn’t spend all our time and money there, so we did end up hopping out to Moon Tower and then to some other clubs down in Nanba before calling it a night. Overall, I would call it a successful and entertaining Halloween month. Out of these 3 events, I’ll probably keep the Rampage event off my list this year, and just check out smaller bar events or just want the park. Before heading to Rampage, we hung out in the park again! 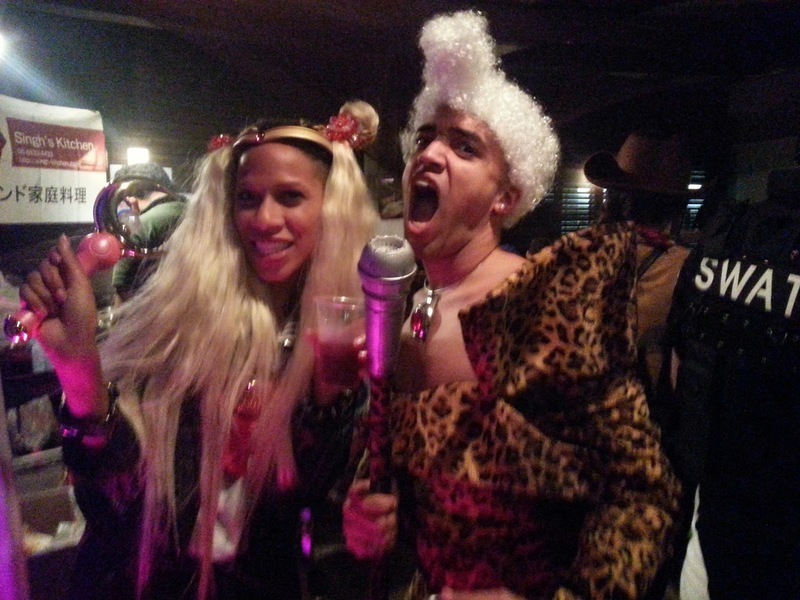 Along with Leeloo, I met a Ruby Rhod!! Super green!